I spotted this family of Red Foxes under a bridge as I was driving yesterday. I found a place not too close to park so I didn't frighten them and carefully walked to a place above that bridge where I could hide behind some vegetation and get these pics. I wanted to stay and get more but they were so relaxed and the kits playing that I didn't want to chance being seen and ruining their chance to enjoy themselves. 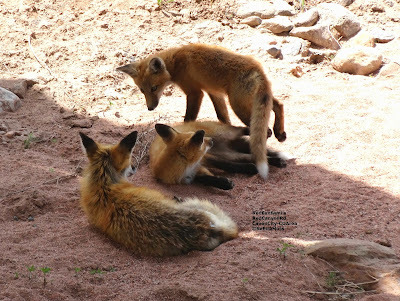 Red Fox Family: relaxing in the shade from SeEtta Moss on Vimeo.